This post The Lost Secret to U.S. Growth appeared first on Daily Reckoning. Mr. Jerome Powell claimed his band of 12 would be ?patient? with rate hikes. But we are not so concerned with the day's changing scenery, the shifting kaleidoscope. Our concern is rather the grand sweep, the long view? the perspective of the circling eagle. But first a check on the here and now? The stock market took Powell's announcement in full stride. ?Productivity growth over the last 350-plus years,? says Michael Lebowitz of Real Inve?stment Advice, ?is what allowed America to grow from a colonial outpost into the world's largest and most prosperous economic power.? Productivity growth averaged 4?6% for the 30 years post-WWII. But average productivity has languished between 0?2% since 1980. What might account for America's declining productivity growth? Might it relate to Nixon's murder of the gold standard in 1971? America no longer had to produce in exchange for goods? or worry about losing its gold. The stagnation of productivity growth started in the early 1970s. 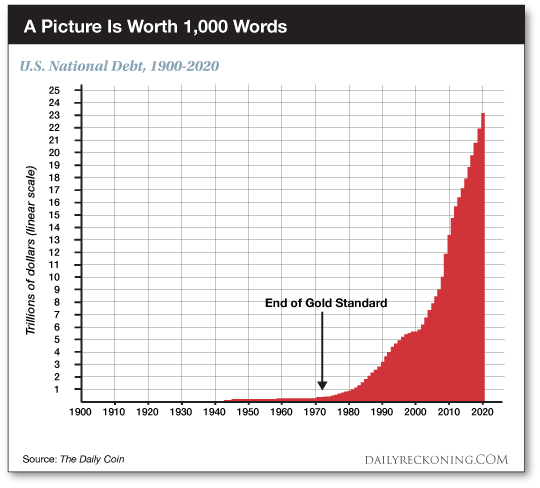 To be precise it was the result, in part, of the removal of the gold standard and the resulting freedom the Fed was granted to foster more debt? over the last 30 years the economy has relied more upon debt growth and less on productivity to generate economic activity. ?Unfortunately, productivity requires work, time and sacrifice,? he adds. A debt-based economy steals from the future to satisfy today. It brings tomorrow's consumption forward to today, that is to say? and leaves the future empty. Debt has one primary dynamic: Borrowing money to consume something in the present brings forward consumption and income? If we choose to consume now, we have less income to save for future consumption or investments. If we sacrifice consumption today, we have more money in the future for consumption or investing? And the present files greater and greater claims upon the future? A dollar of debt just doesn't carry the load it once did. That is, last year's borrowed buck wielded perhaps 1,000% less juice than 50 years ago. ?If debt were used for productive activities,? concludes Lebowitz, ?economic growth would have risen faster than debt outstanding.? In 1970 ? the year before Nixon cut the dollar's final tether to gold ? public debt totaled $275 billion. Or in today's dollars, $1.2 trillion. Compare the past decade's 2.23% to the larger 3.22% trend since 1980. "Given the finite ability to service debt outstanding… future economic growth, if we are to have it, will need to be based largely on gains in productivity." The post The Lost Secret to U.S. Growth appeared first on Daily Reckoning.